The winter months in Michigan have arrived, which present challenges for all. And while for many of us, challenges mean shoveling sidewalks and giving ourselves a few extra minutes for our morning commute during hazardous road conditions, the elderly population faces even more challenges with their health and safety. Here are some seasonal hazards to be aware of during these winter months and ways that AmeriStaff Nursing Services can help you and your family to put your mind at ease knowing that your loved one is safe – no matter what surprises we are faced with this winter. Increased risk of falls: Slipping on icy steps or walkways can result in serious injuries such as hip or wrist fractures or even head trauma. AmeriStaff caregivers can retrieve mail and newspapers and will remove shoes and boots to avoid snow and ice melting indoors, which could lead to additional slip and fall hazards. Power outages: Heavy snow and windstorms can leave many without power, electricity and heat. This situation can be especially dangerous for someone who relies on electrical medical equipment or oxygen. Our caregivers will ensure that your loved ones are safe at home; providing warm clothing and blankets, making sure phones are fully charged and there is a reasonable supply of food, water and medication at all times. If a power outage does occur, transportation can be provided to another designation for warmth and safety. 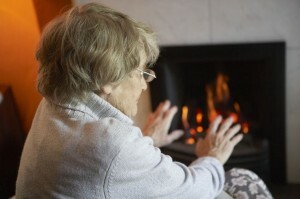 Hypothermia: As people age, they produce less body heat. Older adults may also be less aware of their body temperatures due to medication and additional health issues. AmeriStaff caregivers will monitor signs of hypothermia as well as the temperature inside the home. We will ensure that your loved one is properly dressed to stay warm. Cabin Fever: The winter blues don’t just occur among the elderly population, but it does tend to affect them more because of hazardous road conditions or heavy snowfall, which can make it difficult to leave the house during winter months leading to isolation, boredom or even depression. AmeriStaff caregivers provide companionship and company, with games, crafts, baking or reading a favorite book. We can also provide transportation to allow your loved one to get proper exercise in an indoor facility such as a mall or shopping center. The winter months are also a time of year that many people retreat to warmer climates to avoid the cold weather. If you are hesitant about leaving because you provide care to an elderly family member or loved one, let our professional caregivers give you that much needed break. We will ensure that your loved ones are taking the proper safety measures in the familiar setting of their home. Our companions and homecare professionals will provide companionship, assistance with daily activities, housekeeping, meal preparation, medication supervision and regular reports so you know how your loved one is doing. For more information on AmeriStaff Home Nursing and our services, please contact 248-288-2270 or visit www.ameristaffservices.com.